The Nuggets are yet another beatable team in what is a particularly soft patch in the Wolves’ schedule. (Eds. Note: The Wolves’ next five games are against the Knicks, Pistons, Raptors, Bucks, and Bobcats.) The big news is that Kevin Martin and Nikola Pekovic are both back in the lineup and appear to be healthy enough to make big contributions during this stretch. Martin played well on Saturday at Sacramento after being sidelined for seven games with a fracture in his left thumb, which he suffered on February 7th . K-Mart scored 26 points on 9-16 from the field in 34 minutes. Perhaps more important, Martin showed little sign of rust or fatigue: After having looked somewhat rundown prior to his injury, Martin came back looking refreshed and able to draw on his full repertoire of offensive moves. Hopefully Martin will be able to build on Saturday’s performance and string together a bunch of games that look more like his November splits than his December ones. Nikola Pekovic returned to the lineup on Saturday at Sacramento after missing 13 games since he left the lineup on January 27th with bursitis in his right ankle. Like Martin, Pek also played well in the team’s win over Sacramento, scoring 20 points on 8-12 from the floor and snaring 9 rebounds. Prior to the game, it was announced that Pekovic was expected to have his minutes limited to 20. However, he ended up playing 28 minutes, which hopefully indicates that his ankle wasn’t sore, and not that Rick Adelman simply left him in the game to give the team its best chance to win one game despite the potential longer-term consequences for Pek’s health. 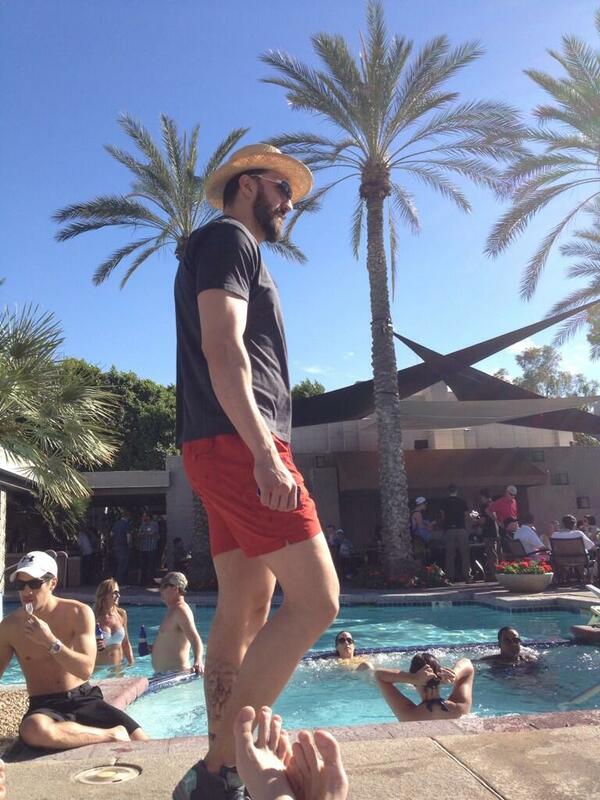 To be sure, Pekovic looked pretty healthy whilst lounging poolside in Phoenix, as the picture above attests. Nuggets: Lawson In, Manimal Out? For the Nuggets, Ty Lawson might return from injury tonight, according to NBA.com. Lawson, who has missed the Nuggs’ last nine games, is easily the team’s best player. He’s so much better than his replacement at the point guard position – former Twolf Randy Foye – that the impact of his status on the team can hardly be overstated. Aside from Lawson, the other Nuggets player whom the Wolves usually struggle to contain is power forward Kenneth “Manimal” Faried. Faried is having a somewhat disappointing season, scoring and rebounding at a lower rate than he did last season and playing porous defense. Still, Faried’s freaky athleticism is always a challenge for the Wolves’ earthbound front line of Love and Pekovic to contend with. But Faried injured his knee on Saturday and could miss tonight’s game.